The first time I saw a work of Jean-Pierre Gauthier was at transmediale in Berlin 2006 at the Smile Machine exhibition. 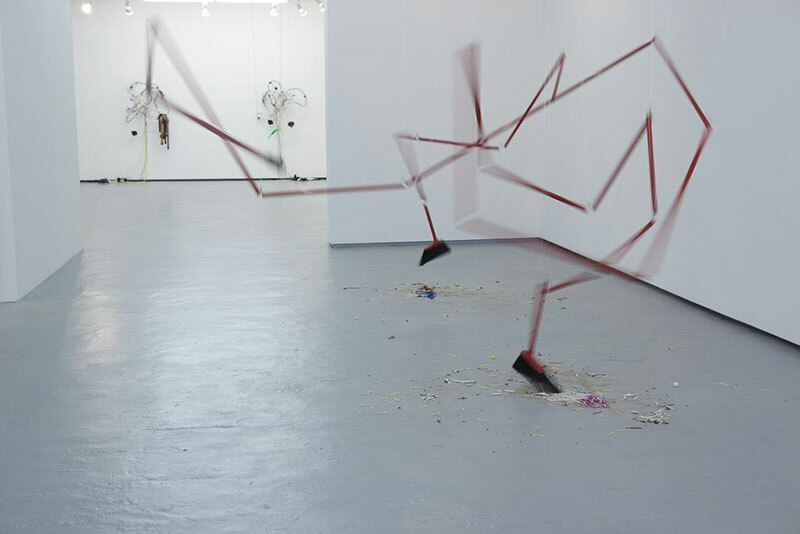 The very same year Electrohype had the opportunity to include his work Effondrements in the biennial 2006. It is an kinetic sound installation where he uses found everyday objects such as buckets, a laundry basket, electric cords and other things you can find in any home. He attach motors to make the objects move. The movement also generates sounds. At the first glance the installation seems to be very simple construction, but after a while you realise that the installation is actually very carefully composed, visually as well as sonically. It is very interesting to see how he gets the objects to communicate and correspond with each other. The movement is chaotic and balanced in turns. Another work by Jean-Pierre Gauthier is Ni un cube et Ni une maison / Not a Cube and Not a House. I have never had the opportunity to see this work as a whole in an exhibition, only a part of it in his studio in Montreal. 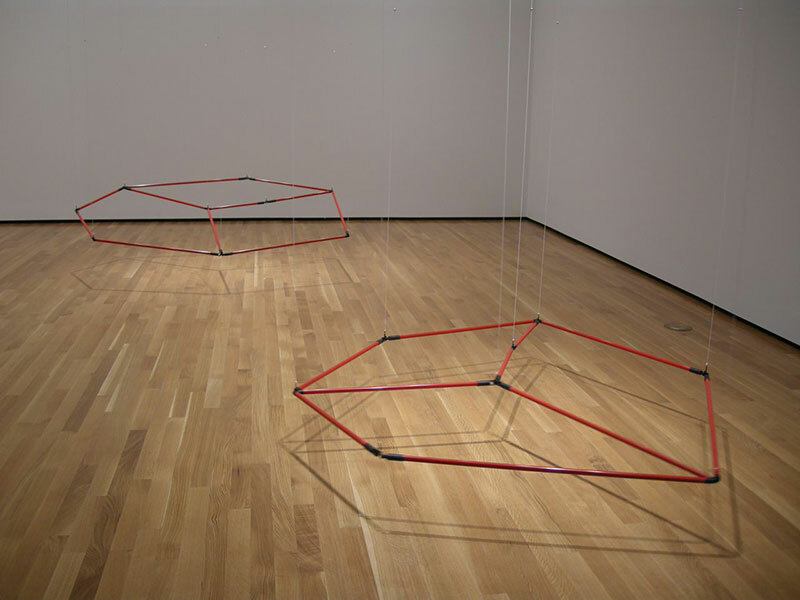 This work consists of two constructions hanging from the ceiling with invisible strings. 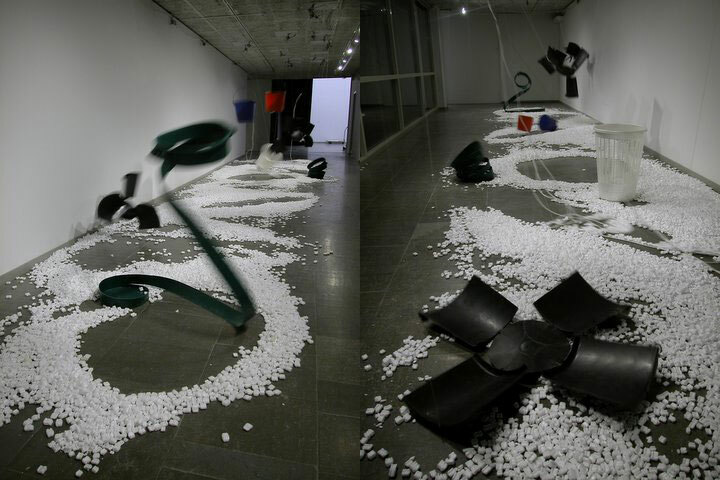 Each construction consists of cleaning mop handles interconnected with each other. One is shaped as a house and the other as a cube. By use of motors the formations dissolve and then seem to struggle in order to find their original shape again. As soon as they have found their “right” position, they freeze for a while, as if taking a break, before breaking apart again. Jean-Pierre Gauthier lives and works in Montreal, Canada. He is working with kinetic sculptural installations. As material, he uses everyday objects that he finds in his surroundings, such as cables, funnels and ventilation cubes, and brings them into life by help of motors, microcontrollers etc. He often adds a playfulness and a touch of humour to his works. His installations are very well composed and include many layers of impressions and thoughts realised with a clever simplicity that engages me.